Featured below are some examples of prosthetic treatment which are not all-inclusive. Often these prostheses are combined with traditional dental therapy to restore health, function and esthetics to the oral cavity. 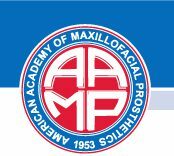 This comprehensive care is possible because Maxillofacial Prosthodontists initially completed 3 years of advanced training in complex oral rehabilitation. If you believe that you might benefit from one of the following services or related treatment, please contact a Maxillofacial Prosthodontist near you for further information.